We’d love your help. Let us know what’s wrong with this preview of Exiliana by Mariela Griffor. To ask other readers questions about Exiliana, please sign up. When one is stripped of country, home, family, lover, to what does one cling? Mariela Griffor will always have language, her chosen tool to rebuild. In this, in her poetry, she takes root. She has found a new home, even as her heart aches for another home in the distance of time and place. She has made her home in a new country, surrounded herself with a new family, and her poetry attests new love. the grief does not disappear. Griffor has lived a life as complex as a novel, rich and filled with loss and tragedy and redemption. Born in Concepcion, a city in southern Chile, she was involved in politics from age 15, fighting for democracy and against the Pinochet dictatorship. Her first great love was a comrade in arms, and he was killed as such, even while she, still in her early 20s, carried his child and was forced into exile. Life tossed her first to Sweden, then a new love to the United States, where she now lives in Grosse Pointe, Michigan, today a poet and publisher, founder of Marick Press. 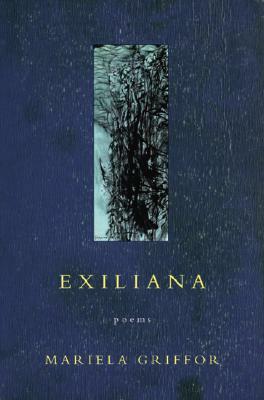 If a poet’s biography rarely makes it to the top of a book review, but is left usually as an after note, Griffor’s story is unavoidable here, for Exiliana is a song of her exile, of love for home old and home new, of an undefeated if still sometimes suffering spirit. Her history is in her poetry, her scars give it its meter, her passion its rhythm, her strong spirit its vibrancy. In her first poem, “Prologue,” Griffor sets the stage as an outsider, one standing apart, yet even then, defining a new way to continue her life. remembrances of the old country. Out here, I invent new sounds, new men, new women. I assassinate the old days with nostalgia. I don’t see but invent a city and its people, its fury, its sky. I don’t belong to the earth but to the air. As I invent you, I invent myself. When roots are not allowed to sink into the soil where one stands, one grows them in air, easily moved from place to place, rooted instead in those invented men and women, and in that newly invented life. Griffor’s song of exile will resonate with anyone who is at home away from home, perhaps in poetry offering home to others likewise uprooted. She captures that paradox neatly—of embracing one while longing for the other, past and present, old and new, dark and light, somehow managing to remain fully faithful to both. Her poems are the letters of a lover, and her love is even more fierce for its testing. She pays the cost of loving so fiercely, but it is that ferocity of spirit that is her key to survival. Her poems travel from her long ago home of Chile, to a rainy day in Michigan, wander along the cold streets of Scandinavia. Her poems dig down into coffins where lost lovers lie, soar to distant mountaintops, linger in a child’s all-seeing eyes, scratch with long nails at jealousy and envy, and know more than one moment of simple truth. Her poems sear love with its loss, accept new love with its patience and comfort, remember the chill of a grandmother’s absent “cyanide smile,” and contemplate the first moment of chaos in a butterfly’s flap of wings in faraway Santiago. When so tossed, one begins to understand: “we were alive, full of sun and fears.” Love is shallow when wasted on the perfect, but blossoms fully with blessing when lavished on the imperfect. Joy stands best when planted firmly beside tragedy. Home is most appreciated by those who have lost theirs. We have left a joy pending. who know that life at any moment can go extinct. Happiness thrives on grit, “what fresh happiness that was,” sharing a sleeping bag with a lover and the sand creeping in. From impersonal, Griffor focuses on the personal, stepping away for a moment to see her lover as the dead patriot, as others see him, but to her, he is the memory of a shared chocolate ice cream or a clay candlestick long ago lit. She has the heart of a warrior, a survivor, still standing and strong if heavily scarred. I have lived among men of flesh and blood. men of flesh and blood. I have come back in the darkness to encountering them. Exiliana is a necklace of pearls made of such encounters. Griffor has caught the shadow in her clear, clean and simple language (and one wishes at times to see the originals in her native Spanish, if only to hear another kind of music and shift in rhythm), leaving no room for misunderstanding. This is life at its harshest, love at its most tender, grief at its darkest hour. This is poetry also of healing, encouraging all fallen to stand again, even her present city of Detroit, fallen in its own battles, to which she writes more than one poem like a ballad, or a war cry, to banish its voodoo and shame and rise again. Griffor is a poet of contrast and paradox. With so much of loss and grief, and wounds time refuses to heal, a reader might fear sinking into such poetry—but should not. Only recall the poet’s reminder that love for perfection isn’t really love at all, but an easy ride soon forgotten. Love for the imperfect that we all, after all, are, is the only kind that sustains. There is a golden thread of hope and endurance through these lines, and Griffor’s poetry sustains by mirroring the battles of life that, to some degree, we have all known and survived. drench the city like a storm. Let your dreams flourish and endure. Mariela Griffor was born in Concepcion, Chile, and attended the University of Santiago and the Catholic University of Rio de Janeiro. She left Chile for an involuntary exile in Sweden in 1985. She and her American husband returned to the United States in 1998 with their two daughters. They live in Grosse Pointe Park, Michigan. She is co-founder of The Institute for Creative Writers at Wayne State University and Publisher of Marick Press. Her work has appeared in periodicals across Latin America and the United States. Mariela holds a B.A in Journalism and a M.F.A. in creative writing from New England College. She is Honorary Consul of Chile in Michigan. Recommends it for: People interested in poetry.